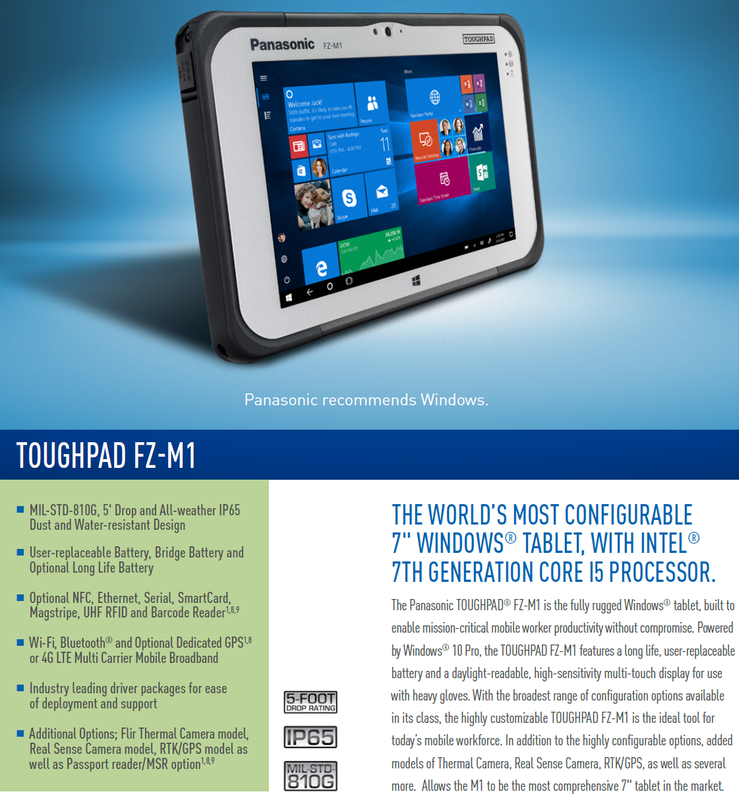 The Pananasonic Toughpad® FZ-M1 mk2 fully-rugged 7-inch table has been updated to the FZ-M1 mk3 . Featuring a faster 7th Generation Intel® Core i5 vPro processor, the advanced Microsoft Windows 10 Pro operating system, a single battery providing up to 8 hours of continuous use* and optional bridge battery, long life battery and other improvements. With new options for an integrated UHF radio-frequency identification (RFID) reader or contactless smart card reader,RTK GPS, and optional certification for use in hazardous locations, the Toughpad FZ-M1 mk3 delivers significant upgrades to improve worker productivity. Also for added security, an optional Opal-compliant, self-encrypting drive is now available to order. Contact us for assistance with your configuration requirements and pricing. Lead time for this product is 6-8 weeks. We may have pre-configured models available and we can retrofit select models to ship quickly.